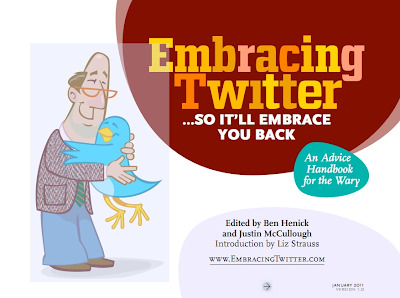 Today, I learned that the e-book Embracing Twitter has just been released. "What is Embracing Twitter?" you ask. Well, for starters, it is a wonderful book that shares insight related to Twitter from thirty-five experienced users (including me!). The contributors shed light on how to maximize Twitter for business needs but also offers advice on how to simply enjoy the experience. Is This FREE Book For You? Are you not sure what Twitter can do for you? Are you concerned about Twitter’s reliability? Are you avoiding Twitter because it requires too much time? Concerned that you aren’t the sort of person who would be on Twitter? Do you feel discouraged or out of touch because of all of the “buzz” about Twitter? Are you already on Twitter, but not getting much out of it? Do you think Twitter is a hipster toy and nothing more than a distraction? Are people telling you that you must join Twitter? Do you want more traffic for your website, videos, or other online content? Do you want to know when someone is talking about you or your business? Do you want to be where your customers are? Let me stress that there is something in this book for everyone. Consider reading one article per day for the next 36 days and tell me if you're not moved, changed, or better in some way. This book was created with YOU in mind, so enjoy it. While you're at it, why not share the link with your friends, family, coworkers, church family, and fraternity/sorority members. Go ahead, it's FREE! Once again, I would like to thank Justin McCullough (@mccjustin) for inviting me on the project. While this may be a surprise to some, this is my first (and hopefully not my last) ebook, so it has a special place in my heart. In addition to Justin, I would like to thank Ben Henick (@bhenick) for his editing skills, Liz Strauss (@lizstrauss) for her contribution, and to the other 31 authors who helped make this project come to life.